Anyone who’s measured their home for a new piano or sofa can appreciate the challenges. How will it get through the door, turn through passageways and scale to the room and its contents? Now imagine measuring a piece of industrial equipment, the size of a tractor trailer, that connects to a highway of plumbing and electric cables—and the task might seem unsurmountable. Brian Christiano faces the latter kind of scenario all the time. And since the president of BC Engineering and Design LLC in Columbia, South Carolina isn’t measuring furniture, his job is much more difficult, the stakes far higher and his customers much more demanding than those involved in any residential upgrade. His company specializes in “Building Information Modeling,” or BIM. To those responsible for planning, designing, and managing construction projects or infrastructure renovations, Christiano offers an indispensable service. Image 1. An exterior scan of the Curtis Wright hanger at Hamilton-Owens Airport (KCUB), Columbia, South Carolina. If Christiano and his team were to measure your living room, they would start by scanning it with a portable 3D laser scanner. Within minutes or hours (depending on the size of the space), a beam of laser light will have been bounced off every surface and object, from the wine rack in the corner to the dust bunnies under the loveseat, digitizing the exact location of each. That’s when the hard part starts. 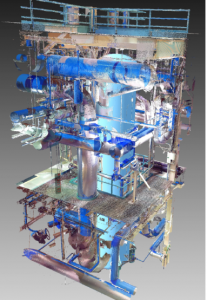 For all their high-tech capabilities, laser scanners only provide a “point cloud,” a massive collection of data that someone then needs to modify and refine into a coherent, 3D model of the scanned structure’s interior and all that it contains. No easy task. Christiano is used to challenges, however, having served in the United States Navy’s submarine force for more than two decades. Beginning in 1969 as an electrician on a nuclear-powered ship, he worked his way up, gaining responsibility as the ship’s power plant supervisor and—after getting his college degree—earned a commission as a US Navy officer. He was promoted and served as a submarine nuclear Weapons Officer on a ballistic missile submarine before retiring. When he left the military he took a job as a government contractor working out of Charleston, South Carolina. It was here that he first learned the power of 3D CAD modeling. On the Trident submarine project, Christiano mapped out the ship’s communications room by manually measuring the various surfaces and then drawing them in 3D space. It wasn’t long, however, before he replaced his plumb bob and tape measure with a laser scanner. BC Engineering quickly became known for its expertise at virtual modeling and finite element analysis, reverse engineering, machine design and, more recently, aerial drone inspection services. Fast forward twenty years. The company’s completed project list is now extensive. Among its hundreds of industrial structures and many thousand laser scans, BC Engineering has also scanned the Church Brew Works in Pittsburgh, South Carolina’s 1740 Litchfield Plantation Home, the Columbia Canal Power Station, and the Curtis Wright Hangar at nearby Owens Field (where Christiano can be found flying his airplane on the weekend, if he’s not too busy scanning iconic buildings). In each case, he and his team took dozens of images from which the building structures were tediously reconstructed. “Tediously” is an important word to note. 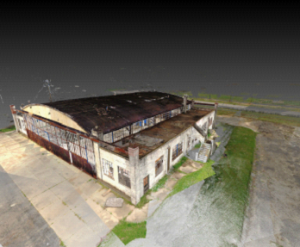 Even though laser scanning makes it relatively easy to collect the millions or perhaps billions of data points used to describe an object in three-dimensional space, how efficiently one can process that information is largely what determines any project’s profit margin and client cost. Images 2a and 2b. With InfiPoint’s robust import/export capabilities, CAD to point cloud and point cloud to CAD comparisons are easily done. 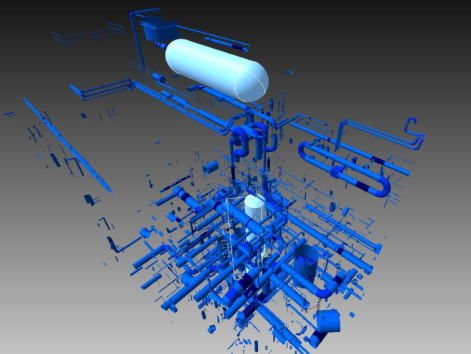 Shown are combination CAD and point cloud from two different angles. 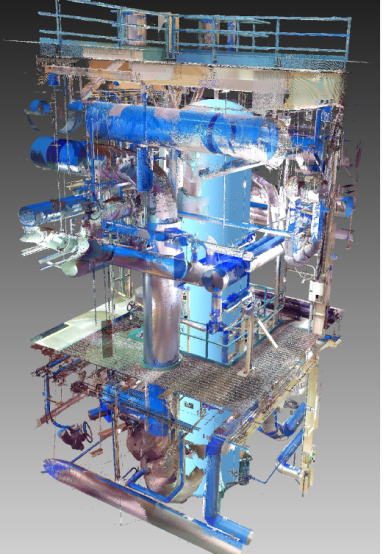 In BC Engineering’s case, an elaborate workflow had been developed over the years to turn that nebulous point cloud into a usable 3D model. It started by exporting the raw data from the laser scanner, verifying its accuracy, then slicing the point cloud at various locations and extruding the cross-sectional profiles of the pipes, beams, walls, and other objects found within. Six separate software packages were required, as well as plenty of manual intervention by the CAD operator in an attempt to determine what’s what in the point cloud. Hundreds of hours were spent tying virtual structures together, filling in gaps between architectural members, and reconstructing ghostly walls, floors, and ceilings. Worse, several of the disparate software packages used were slow and unreliable, prone to routine crashing. This caused vast amounts of rework as well as employee frustration. Software upgrades across multiple platforms were difficult, often resulting in incompatibility between different systems. Some improvements were made when the scanner manufacturer released a software version with “smart look-ahead” capabilities that automated part of the workflow, but the process was nowhere ideal. Image 3. Automatic data point registration and bundled adjustments of scan positions of this typical pumping station with piping and supports took only eight minutes with InfiPoints. 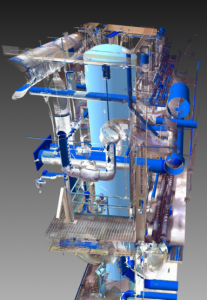 InfiPoints, from software provider Elysium Inc., Southfield, Michigan, is a “point cloud utilization” tool that offers data import, pre-processing and analysis, CAD modeling, and a host of other functions previously unavailable to BC Engineering and Design. 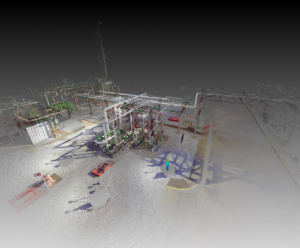 These include “fly-through” (video1, video2) capabilities that allow customers to take a virtual tour before construction begins, automatic mesh generation and feature recognition, noise reduction (for removing people and other moving objects found in the point cloud), and real-time collaboration tools. It also provides those much-needed travel path calculations. A more recent example of this was BC Engineering’s work on a paper mill project. Because the 10-inch diameter pipe used by the mill had a black matte finish, the laser scanner was unable to pick up certain areas. This resulted in the legacy software being unable to recognize it as pipe, requiring the engineer to manually draw each length. 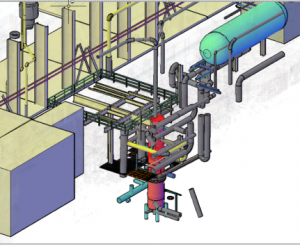 InfiPoints, however, was able to extract the pipe with ease, as well as the surrounding conduit, railings, electrical boxes, walls and floor, saving the team countless hours of modeling effort. Image 4a and 4b. With one of BC Engineering’s legacy CAD tools, modeling of this power plant feedwater heat exchanger took more than 400 hours (right image). InfiPoints extracted the relevant data in 19 minutes, leaving engineers with little more than minor cleanup work (left image). As mentioned earlier, InfiPoints has also allowed the team to drastically simplify their workflow. What were once six separate software packages are now two, and in some cases InfiPoints can do the entire job on its own. Considering the additional functionality, they’ve gained, BC Engineering estimates that an additional three software packages would have been needed to achieve the same functionality on the old system. There’s also the IT aspect to consider. The company no longer must manage multiple software packages. Labor and software maintenance costs are reduced. Training time for each new release has fallen and is no longer a concern. And best of all, there are no more crashes.